con·sci·en·tious [kònshee énsh?ss] adjective 1. painstaking: showing great care, attention, and industriousness in carrying out a task or role a conscientious parent 2. in accordance with somebody’s conscience: governed by or done according to somebody’s sense of right and wrong a conscientious decision to dedicate an hour a week to volunteer work [Early 17th century. Via French < medieval Latin conscientiosus < Latin conscientia (see conscience)] -con·sci·en·tious·ly, adverb -con·sci·en·tious·ness, nounconscientious or conscious? If you are conscious you are awake or aware: The patient is conscious;We are conscious of the danger. Conscious can also mean "deliberate, intentional," as in We made a conscious [not conscientious] move to win the championship. 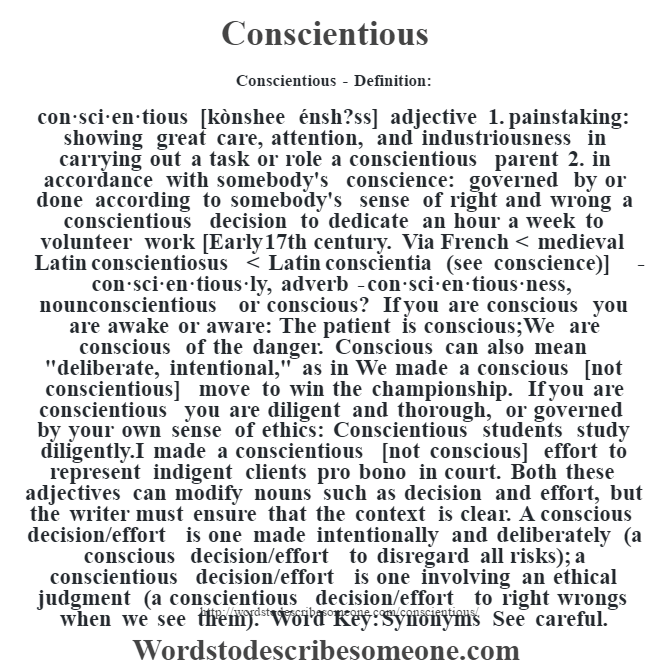 If you are conscientious you are diligent and thorough, or governed by your own sense of ethics: Conscientious students study diligently.I made a conscientious [not conscious] effort to represent indigent clients pro bono in court. Both these adjectives can modify nouns such as decision and effort, but the writer must ensure that the context is clear. A conscious decision/effort is one made intentionally and deliberately (a conscious decision/effort to disregard all risks); a conscientious decision/effort is one involving an ethical judgment (a conscientious decision/effort to right wrongs when we see them). Word Key: Synonyms See careful.